The Chevrolet Suburban can tow a sizable trailer. It can safely transport up to nine passengers. And, equipped with genuine four-wheel drive, it can haul a load of cargo over primitive roads. It’s an adept workhorse and arguably the best SUV you can get for towing trailers. 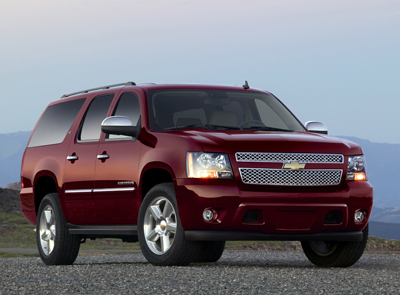 For 2011, Suburban is available with a new towing package that includes an integrated brake controller. 2011 Chevrolet Suburban models come with more standard equipment than last year’s models, including Bluetooth and upgraded trim. The 2011 Suburban LTZ 4WD comes standard with a two-speed transfer case, allowing low-range operation, and chrome recovery hooks. Launched during the Great Depression in 1936, the Suburban was completely redesigned for the 2007 model year. The Suburban can hold 137 cubic feet of cargo, or up to nine passengers and 45 cubic feet of cargo, or myriad combinations in between. Two weight classes are offered, the normal 1500 and the heavy-duty 2500. The 2500 is a good choice for towing trailers. The Suburban is available with two-wheel drive or four-wheel drive. The 1500 and 2500 are available in LS and LT trim levels, and the 1500 is also available in a more luxury-oriented LTZ trim level. Suburban 1500 models come with a 5.3-liter V8 engine of 320 horsepower, 335 pound-feet of torque and a 6-speed automatic transmission. The engines in 1500 models with two-wheel drive have an iron block, while models with four-wheel drive have an aluminum block; both versions have aluminum heads. Fuel economy for a Suburban 1500 is an EPA-estimated 15/21 mpg City/Highway. Suburban 2500 models get a 6.0-liter V8 with aluminum block and heads and variable valve timing rated at 352 horsepower and 382 pound-feet of torque. It also comes with a 6-speed automatic. Suburban 2500 4WD is rated at a woeful 10/15 mpg. Sadly, a diesel engine is not available. The Suburban 2500 uses a different steering gear, brake parts, suspension, alternator, wheels, tires, axles and fuel tank than the 1500 series. The primary reason for selecting the 2500 over the 1500 is for its greater towing capacity. A Suburban 2500 4WD is rated to tow up to 9,400 pounds, or 9,600 pounds with 2WD. A Suburban 1500 4WD is rated to tow up to 8,000 pounds. All engines are E85-compatible, which means they will run on 85-percent ethanol fuel, and all have Active Fuel Management (AFM) which switches off half the cylinders when the additional power or idle smoothness isn’t needed. Fuel economy with E85 is a dismal 11/16 mpg for the Suburban 1500, however. The EPA hasn’t published E85 fuel economy for the Suburban 2500, perhaps because it involves single-digit numbers. The 2011 Chevrolet Suburban 1500 LS ($40,925) comes standard with cloth interior, power locks and windows, three-zone air conditioning, leather wheel with cruise and audio controls, woodgrain trim, tinted rear windows, roof rack with crossbars, folding power heated mirrors, a seven-wire trailer harness, 17-inch aluminum wheels, three power outlets, AM/FM/XM/CD/MP3 sound system with six speakers, USB port, rear audio system controls and two headphone jacks, Bluetooth connectivity, floor and overhead consoles, front bucket seats with six-way power adjustment, 60/40 second-row seat, 50/50 third-row split-bench seat, paint-matched mirrors, door handles and side moldings, and OnStar with six months of the Directions and Connections plan, which includes Turn-by-Turn Navigation. Suburban 1500 LS 4WD ($43,770) models add the Autotrac system that has on-pavement all-wheel-drive ability (no two-speed transfer case with low range). A 40/20/40 split front bench seat with fold-down armrest and storage is available. Options include a trailer package, which for 2011 includes an integrated trailer brake controller ($430); a Convenience package with adjustable pedals, remote start, rear park assist, and rear camera display in the rearview mirror ($1,060); locking differential ($295); 3.42:1 axle ratio; and engine block heater ($75). Suburban LT 2WD ($44,435) and LT 4WD ($47,280) add leather seating, Bose premium sound, automatic climate control, automatic locking rear differential, remote start, rear park assist, adjustable pedals, fog lamps, and two more 12-volt power outlets (for a total of five). LT models offer a DVD-capable audio system with navigation ($2,500), a rear-seat entertainment system ($1,295), and other options not available on the LS. Suburban LTZ 2WD ($53,170) and LTZ 4WD ($56,170) come with perforated leather seating surfaces, a navigation system with XM NavTraffic and rearview camera, Bose Centerpoint Surround Sound, second-row bucket seats, heated and cooled front seats, heated rear seats, Autoride suspension with rear air assist and self-leveling, and other features. The Z71 Off-Road Package ($1,535) is offered only on the LT trim level, in 2WD or 4WD. Suburban Z71 gets a different chrome grille and fascia, body-colored fender flares, tubular assist steps, 18-inch wheels with on/off road tires, off-road suspension package, skid plate, higher-capacity air cleaner, and badges. Safety equipment on all models includes dual frontal airbags, front seat-mounted side-impact airbags, full-length head-curtain airbags, front seat-belt pretensioners, a tire-pressure monitor, anti-lock disc brakes with electronic proportioning, and StabiliTrak, GM’s electronic stability program with anti-rollover mitigation and traction control. OnStar telematics will send help if the airbags deploy and you don’t respond. Safety-related options include rear park assist, and side Blind Zone Alert. Suburban's profile is elegant in its simplicity, no lines drawing the eye up or down, just a smooth clean surface from one end to the other like an aircraft. Big boxes are best carried in big boxes, not sloping hatchbacks. The driver's seat offers a good view over the low dash, perhaps the best visibility in truck-dom. The seats are designed for American comfort rather than European firmness, and can be ordered with heat and cooling. The front seats are bucket seats on most models, but a bench seat can be specified to allow three passengers in the front. The second row can be outfitted with a bench seat or a pair of buckets. The bench seat is split, so the right third of the seat folds independently of the left to allow curb-side entry to the third row; it also allows skis or boards on the right with two passengers on the left. With bucket seats in the second row, you can climb into the third row from either side; the second-row buckets can be released at the touch of a button, and are heated if you option right. Only full-size utilities and crossovers, minivans, and Ford's Flex offer the kind of room you find in the first two rows of the Suburban. The third row seat has three belts but just two headrests, and it splits 50/50 right down the middle where a center passenger would go. It's really only good for two people. The third-row seats do not fold flat with the floor, so if you want a long flat load deck to camp, carry building materials or dog boxes, you have to unbolt the third-row seats and leave them at home (our recommendation if you don't need them). Cabin materials and style show a pleasant feel and appearance more car-like than utility appliance; with woodgrain trim, and leather in the upper models, the only reason to upgrade to an Escalade ESV would be more power, but you'd lose 4WD trail ability in the process. The navigation and audio system is easy to operate. It includes a touch-screen monitor. We set the programs we liked, and could switch from an XM to AM to FM to digital file with one finger push. OnStar has been further refined, XM real-time traffic data is available. With the navigation system, the rearview camera displays a large image of what's behind you onto the display screen whenever you shift into reverse. It can help you spot a child or shopper when backing up. It also makes parallel parking quicker and easier, and it makes hooking up a trailer much easier. Without navigation, the image is displayed one the rearview mirror, which is small and hard to see. The Suburban 1500 engines are rated at 320 horsepower at 5200 rpm and 335 pound-feet of torque at 4000 rpm. All Suburban engines have a fuel shut-off feature, called Active Fuel Management, that cuts fuel to half the cylinders when full power is not needed. This will be most noticed on level ground at moderate, steady speeds. You won't notice when it changes back and forth, because it's very smooth. And it delivers big benefits in fuel economy. The Suburban 2500 uses a 6.0-liter engine of 352 horsepower. Like the others it features a Tow/Haul mode for less shift busyness over rolling terrain and a bit of compression braking. The 6-speed automatic transmission pays benefits in performance, fuel economy, noise, and control, whether towing or not. With low gears that make it easy to get going, high gears that keep engine speed to a minimum on the highway, and more gears in the middle so you can tow uphill without screaming along in second gear, the 6-speed is a very nice feature. The shifter has PRNDML positions and a thumb-operated rocker switch for changing gears manually. However, you first have to move the entire lever to the M position. Or you can move it to D and leave it shift itself. Guiding a Suburban is effortless, the steering nicely weighted and direct by truck standards. At 18.5 feet long and 6.6 wide the Suburban isn't ideal for congested areas but it's quite maneuverable for its size; it needs 43 feet of road to make a U-turn (45.3 for the 2500), but that's just a yard more than some two-seaters and small sedans. So, it's pretty good, in other words. And because of its boxy shape the corners are reasonably well defined; available rearview cameras and park sensors make it easier to parallel park but it won't drop right in. An available blind spot alert system adds a warning if you didn't see the vehicle next to you; like all such systems it focuses on your car and not what might be next to any trailer you're towing. Autoride suspension is standard on LTZ. It monitors the road surface and driver inputs and adjusts damping as needed, optimizing the blend of ride comfort and handling grip, and also limits body roll in heavy cornering. The self-leveling rear suspension aspect of Autoride might help while towing but it is no substitute for a proper weight-distributing hitch. The 2500 Suburban has a different feel than the 1500 but drives through the same controls. Since it is designed for heavier use, carries about 600-900 pounds more and tows about 1500 pounds more the bits underneath are more truck-like. It has a much stronger rear axle with a shorter ratio, Chevrolet wisely thinking 2500 owners will prioritize towing performance over empty highway fuel economy. The rear suspension uses leaf springs rather than the 1500's coil springs. All these parts add weight so the 2500 rides a little bit firmer and isn't as quick to turn as the 1500 but it is still a very competent chassis and at full load feels like it rides and handles at least as well as a loaded 1500. Were we regularly towing 6,000 pounds, or 5,000 with the family and gear onboard, we'd opt for the 2500 and its stouter running gear. We suspect the 2500 will feel more stable than a 1500 when pulling a 5,000-pound trailer. By default all Suburbans are set up for towing, but for larger loads, such as anything more than a twin-axle bass boat trailer, consider opting for the trailer towing package (more engine oil and transmission fluid cooling), larger outside mirrors, and the integrated trailer brake controller. (Note that the controller may not work with electro-hydraulic trailer brakes as on some higher-end RVs; so consult your dealer.) A Suburban with this tow package is a fine tow vehicle, indeed. We've done major cross country tows over frozen highways and the Suburban performs admirably in this type of duty. The Chevrolet Suburban has always been a very capable sport utility vehicle and big on practicality for month-long excursions or weekend wipeouts. It is big, powerful, smooth, and, with the 6-speed automatic, decent on fuel consumption. Suburbans are designed with towing in mind and offer room to bring the big family and all the things that go with them. Head/hip/leg room, f: 41.1/64.4/41.3 in. Head/hip/leg room, m: 38.5/61.8/39.5 in. Head/hip/leg room, r: 38.1/49.4/34.9 in. Cargo volume: 137.4 cu. ft.